Google Chevy Bolt battery fire and you will not find a single story that says Chevy Bolt had an accident and battery caught fire. Yet, there are number of Tesla cases where the battery caught fire after an accident. Why Tesla batteries catch fire while Chevy Volt and Bolt batteries don't. Or at least, in the case of Bolt and Volt the battery fires are extremely rare or unusual. Today I saw a discussion in GM Electric Vehicle Owners group on Facebook, in which user Joe Reall answers the question related battery fires of Tesla vs Chevy Bolt and Volt. "The Chevy Volt and Chevy Bolt's batteries are far safer than the Tesla batteries that bursted into flame in the latest incident. Tesla's Panasonic cells are made with thin metal casings so that the heat from one burning cell causes the neighboring cells to burst especially when exposed to air in an accident. The Chevy Volt and Bolt's battery cell casings are much thicker and help prevent breaking apart due to impacts or heat and are also covered with fire retardant. Yes, the batteries of Volt and Bolt are more expensive than Tesla's, Toyota's, Nissan's and Ford's, and has heavier battery weight per unit capacity but it has saved lives and properties. So far, there have been no battery fires from Volt and Bolt in any of the accidents that they're involved. With Tesla on the other hand, the more battery capacity it has, the more intense are the fires and more difficult to put out, although it is still rarer than fires from gasoline cars." As you remember about 10 days ago Tesla Model X caught fire after it hit a barrier on a California highway. Here is the post accident video so you can see the magnitude of the damage. Later Tesla revealed that the Autopilot was engaged and it actually blamed the driver (who passed away from injuries) for apparently ignoring the warnings. Tesla last week recalled 123,000 Model S vehicles to fix a power steering component that is starting to rust. Se need a solid-state battery. "This is why we need a true solid-state battery with no volatile chemistry involved, like the eestor.us device that is now being marketed. They still have work to do to get the energy density per liter to where we need it for vehicles, but they are approaching it pretty fast from what I can tell. Plus, there is virtually no degradation after many, many cycles and it's low cost due to the materials they are using," replied Scott Collins, a user in the group. Also, firefighters need more training. In a story, by Life Science, discussing why the fire that incinerated a Tesla was such a nightmare to put out, the author writes, "what's more, lithium-ion fires can release high levels of "toxic gases" such as carbon monoxide, soot, hydrogen fluoride, and particulates of oxides of nickel; aluminum; lithium; copper; and cobalt, according to a Tesla Model X emergency response guide. As a result, firefighters need to wear a self-contained breathing apparatus and should use hoses that spray fog and special ventilation fans that push air out at a high velocity to protect bystanders downwind of the fire, according to the guide." 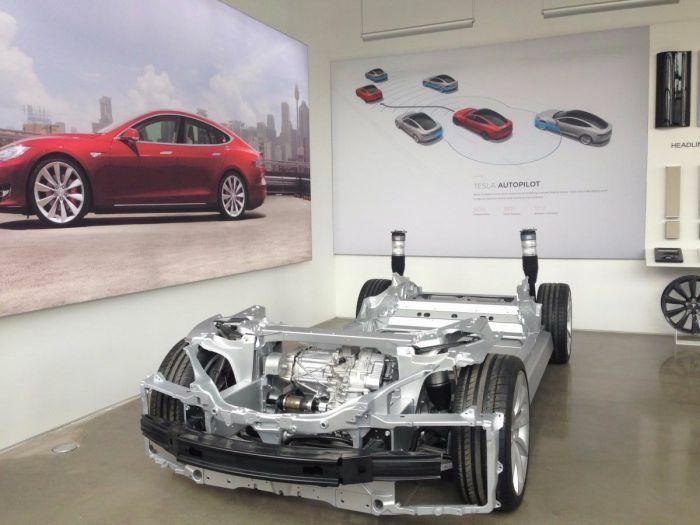 Do you think Chevy Volt and Bolt batteries are safer than Tesla batteries? What about Nissan Leaf's batteries? Please, share your thoughts in the comments section below for discussion. As for the battery fire, there is video online of the wreck still burning after the driver had been extracted. It was no inferno. The interior was not consumed - padding still on the seats, etc. Much of the pack had NOT burned; its partitioning into small, steel-clad cells seemed to be limiting and slowing the spread. Whatever the relative merits of fire protection on different pack designs, fire did not kill this driver. That would've been the internal injuries from running into an exposed concrete divider at highway speed. You didn't show how many vehicles of each kind are on the road vs the number of fires. That's the only number that's relevant. The first two Volts tested by NHTSA caught fire two weeks AFTER a collision, sitting in a parking lot. You neglected to mention Your article is 'inflammatory and keeps the negative news in the headlines' I prefer facts to opinions and anecdotes. You cite a Facebook post as a source? Then proceed to use that Facebook post to prove what? Really? Is this the scientific method at work? Might be convincing if you did a side-by-side fire ignition and extinguishing test of GM Korean batteries vs Tesla Panasonic batteries. Or, do a bit of research and cite a national safety study. You have, as this web pages states, a "professional team of reporters..."
GM Volt batteries are built at our battery plant in Brownstown Township, Michigan.